Wayfinders go beyond the known, and journey on voyages of discovery to new horizons. Central to the wayfinding approach is seeing what is really going on - discerning the detail and seeing the whole. The wayfinder has a deep understanding of themselves, their crew, their waka and the environment. Drawing upon ancient wisdom, modern wayfinders hold insights that can make a big difference for leaders, their teams and organisations and for the future of society – for us all individually and collectively. That’s why we are passionate about studying and sharing their wisdom. Wayfinding Leadership: Groundbreaking Wisdom for Developing Leadersis designed as a developmental leadership journey. We take you on a journey – not just about wayfinding leadership, but most importantly into wayfinding leadership. This book has practical steps and questions to help you apply wayfinding wisdom. Wayfinding leadership is for all of us who want to take up the wayfinding leadership challenge and achieve our full potential. We draw upon and explain wayfinding philosophy and ground this in real world experience. We guide you on a wayfinding leadership development journey that requires stepping into the unknown, developing sharper powers of observation, being more comfortable with uncertainty and finding new and better ways to tackle situations. Rather than rely on rational thinking, wayfinder leaders use the broader sets of intelligence with which they are endowed. A wayfinder leader is motivated by curiosity and is steeped in wonder. 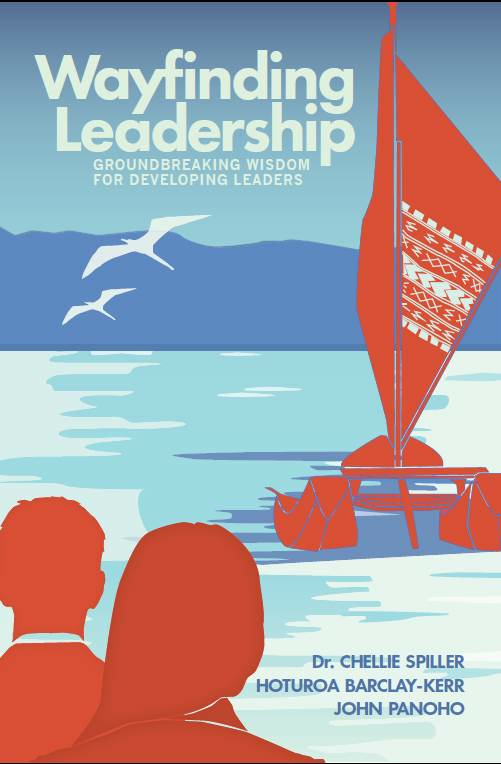 Wayfinder leaders look to develop everyone’s potential and have an abiding belief that ‘we are in the waka together’. Commitment and active engagement is a lifelong process for the wayfinder. It is recognition that learning is a condition of existence, and at the heart of that ethos is a deep humility.